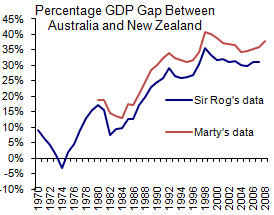 Sir Roger Douglas has a go at my post that looks at the GDP per person gap between Australia and New Zealand and concludes that, since it doubled during the neoliberal revolution of the late 80s/early 90s, implementing more neoliberal policies is unlikely to close that gap. His first complaint is that my numbers and his don’t match up exactly. My data is here on the IMF World Economic Outlook database. Sir Rog got his from the OECD. They don’t differ in trend, only in scale, and I suspect that’s because the IMF ones take into account Purchasing Power Parity and his don’t (if you’ve ever been to Aussie you know that just because your $1 NZD buys 80 cents AUS doesn’t mean that what costs $1 here costs 80 cents there, PPP adjusts for the difference). Next. Ah, the ‘time delay’ play. Select a point in time when things are looking better and say ‘look, that’s due to what I did ten years ago’. Does he have any actual evidence that a plateauing of the GDP per capita gap years after he implemented his policies was due to his policies? No. The big neoliberal policies had an impact straight away. When Sir Rog and his cronies sacked tens of thousands of New Zealanders, that reduced GDP immediately both because their output was lost and because their expenditure decreased leading to more layoffs. When the National government slashed benefits several hundred thousand people had less money to spend straight away, which had a multiplier effect throughout the economy. We can see the results there in the graph. The example of a supposedly ‘delayed effect’ that Sir Rog gives is purposefully deceptive. The number of people on Working for Familes increased because its scope was widened, not because it took time for the policy to filter through. It says something that Sir Rog’s only example a) doesn’t show what he claims b) isn’t a neoliberal revolution policy. This guy really convinced us to sell the family silver with cheap tricks like these? Guess it was easier when the suckers voters didn’t have access to the numbers themselves. when rog realised he would never be the pm then the rot set in. he went looking for a way to punish his erstwhile colleagues and friends in the labour movement and he found one in neo-liberal theories that are mere camoflage for stealing off the state. if he was in china he would be in jail by now. Douglas is like Dante’s fortune tellers – forever cursed to walk with their heads screwed on backwards and thus only able to look at yesterday. Him and Brash. Rog is exactly the type that the SIS should have been checking up on if they were genuinely looking for people doing damgage to this country. And don’t anyone try and run a â€˜Pinochet’ defence, -he is just an old man line, he is still in our bloody government. I only wish Dodgy Roger had the intellectual honesty to tell the truth, that his form of political economy is the promotion of those that have at the expense of those that dont have. AKA Making the rich richer nd the poor poorer. He can trot out all the trite little ditties and new right shibboleths, but he cannot substantiate any of them. And he is too dishonest to say that he is wrong despite all evidence to the contrary. He has become his own garbage bin of history, confined to his own distorted little lies. An interesting anecdote. Over the last three centuries all the economic theories that support capitalism have been promoted by the capitalists – publishers, newspapers etc. All the theories that don’t have disappeared into the nether. Hopefully the internet can reverse this trend as there are a lot of theories out there that prove (ie, mathematical proof) that capitalism and the classical/neo-classical theories that support it are complete bunkum. Second, why did we have rising unemployment during the reforms? For several obvious reasons. One, a previous misallocation of resources will cause unemployment when those assets are liquidated. Two, labour markets were not flexible, and the huge assoicated costs of employing people meant fewer people were employed. Sam K, there are a few things that I take issue with here. * wheres the analysis of WHO benefitted from the growth? * please decode the words “Labour market flexibility” (I can, try deunionisation, lower wages, deminished conditions, easier access to profits for bosses). * where is the accounting for the sale of state assetts underprice? * where is the accounting for the repatriation of resulting profits offshore? I could go on, the dishonesty of the accounts given by the right are exemplified by the ridiculous TINA claims. How come countries that did not go down the neo liberal path have done so much better? First, there is no analysis of that issue. From Sir Roger’s and the Standard’s post, that issue was not in contention. Third, I have yet to see any proof that the assets were sold below price. If you have any I would happily look at it. Fourth, I am unsure why repatriation of profit is a bad, or even relevant, outcome. After all, New Zealand dollars are not accepted in Australia. They must exchange them – and this just gives someone else New Zealand dollars. Our exports are funded by our imports and the profits that are repatriated. Unless you have foreign ownership of capital or import things, then there can be no exports. In the same way I am not concerned with New Zealanders owning things overseas, I am not considered with foreigners owning things here. If you are concerned, are you concerned when Aucklanders buy factories in Gore? If not, why not? Why do politically drawn borders have economic significance? * why no analysis of who benefits? It seems to me this is the point neo libs run for cover as they cannot deny the growth in disparity that demonstrably follows their policies. * labour market flexibility. My description I believe to be far more accurate if you are one of the people laid off etc. Ask a simple question: who benefits most? Who gets the gold? Why do you think Labour organised ion the first place? * Under priced assett sales…Telecom QED. * Repatriation of profits. Why talk in national terms and relativity between nations when cash can fly freely around the world? This is in reality a story as old as empires, it is the exploitation of local resources by remote capital. I can demonstrably prove in historic human terms that this is rarely neutral or beneficial. maybe some benefits might trickle down on a poor New Yorker, this does not help much in Mataura. Again the question to answer is who benefits, and is there any proportionality? On the issue of who benefits, I am perfectly happy to engage with you, if you wish to bring some claims or some data to the table. I am responding to the points made above in the post, none of which directly related to who, in particular, did well. In regard to who benefitted most from Labour market deregulation, I would say that probably the people who could now find jobs. Labour market deregulation saw unemployment reduce from 11 percent to 6 percent very quickly, and continue decreasing. Labour did not completely repeal the new levels of flexibility, because they were aware of the benefits. Saying Telecom does not prove anything. I am unsure of how to value assets. I have no technical skill in that area. I am unsuee why you, as an historian, can state this so authoritatively. In regard to repatriation of profit, cash can fly freely around the world, but needs to be exchanged before it can be used elsewhere. This is important. If you do not like foreign investment, then I repeat, do you fear investment by Aucklanders in factories in Southland? If not, why not? Another economist who seems to think that the Balance of Payments is neutral because it ‘all sums to zero’. It’s not neutral because the NZ$ floats and foreign exchange is a marketplace. If more people want to sell than buy then the NZD decreases in value, and vice-versa. Because NZ has a negative overseas investment to the tune of about $180b, about $12b of that is repatriated as profit overseas. It is by far the largest component of our BoP. Normally this might mean that there are a lot more NZD’s being sold than purchased and the value of the NZD would plummet. In order to prevent this, we have to persuade other people to buy NZD’s. We do that primarily by offering relatively high interest rates on low risk investments, so lots of people/institutions who might only get 1-2% for their cash in a bank in their home country, can get 5-6% if they stick it in an equivalent account here in NZ. In order to minimise the exchange rate risk they tend to place their money on short-term accounts. This has led to the situation where about $60b of the NZ mortgage market, where banks are lending long-term to NZ’ers, have funded this by borrowing very short-term (weeks or months) from overseas. The very real cost of running a large negative BoP (or Current Account Deficit) is the very high interest rates New Zealanders pay for their home mortgages and business funding. It is neutral precisely for the reason you identify. The fact that many others have assets denominated in NZ$ means they need to exchange them. The exchange process lowers the value of the dollar, so that the market can clear. If you are making the claim that this costs us because the value of our dollar is lower, I would reply that a low dollar has benefits and costs. If you said “This process lowers the value of our dollar which harms some people” I would agree. I never claimed anything more or less than that, and you seem to agree. Many countries effectively outsource their savings. America does so as well. If people thought this process was a problem, they could borrow cheaply from overseas, use the capital to buy shares in the relevant companies, and then use the profits to lend out to New Zealanders at high rates. This arbitrage would drive up the cost of others’ currency and decreae interest rates domestically. If you are really concerned that we are being exploited, I suggest you put your money where your mouth is. It seems to me – if the facts you have stated are correct – that you should be able to make easy money in this way.